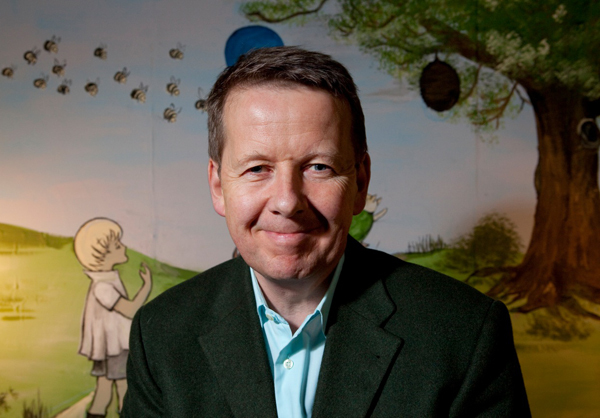 Bill Turnbull, presenter of the Breakfast programme on BBC One, took up beekeeping several years ago when he thought it was time for a new venture and he has since experienced the ups and downs of this fascinating pursuit at his home in Buckinghamshire. As with the many beekeepers in the audience, Bill has been stung all over his body, despite wearing all the required protective gear. In one incident, he had sensed an itch inside his ear and, in the process of drilling the area with his finger, realised too late that it was a honey-bee, which had penetrated the thick clothing and proceeded to sting him viciously – prompting indescribable pain. To date, the most demoralising experience was when he inadvertently killed a queen bee, leaving it split into two. With a heavy heart, he showed the dead creature to his seasoned adviser, who merely produced a sad sigh, knowing the hive’s future productivity had been seriously impaired. However, such melancholic descriptions were elevated by Bill’s expert comedic timing in telling stories, including the occasion when he realised alarmingly that the buzzing creature in front of him was actually inside his protective veil – and that piercing pain was only seconds away. His hilarious delivery was also in evidence when he recounted his time as a contestant on the BBC's Strictly Come Dancing – including the moment he forgot rehearsed moves in the terror at being watched live by millions and calmly danced away from his partner and out of sight of the cameras. When asked about his favourite guests, Bill unhesitatingly mentioned Will Smith, the Amertican actor and singer, who was given a lengthy (and very rare) fifteen minutes on air because he was so entertaining. Off screen, he was friendly with all the crew and left an indeliable impression. On the other hand, sonme stars were less impressive and Bill hinted at who they were, although never mentioneding them by name. One such star was known to wear a hair-piece and when he went into make-up before the show, he was asked gently where it was. "Sweetie," came the reply, "I'm already wearing it". Bill also discussed the imminent move of the Breakfast team from Television Centre in London to the BBC’s new studios in Salford. Sadly, his co-presenter, Sian Williams, has decided not to join Bill and so the programme will be experiencing the end of an era, although also – he pointed out – a new dawn. Just over 130 people were in the hall to listen to Bill’s wonderful talk on December 2nd and the evening raised just over £800 towards upgrading the building, with the next phase a new roof comprising cedar shingles, which should be completed in 2012.